For almost any surface, cold water pressure washers are good in cleaning dirt. However, pressure washers of this kind are not capable of removing oil and grease effectively. So, if you think you have to work on surfaces that require degreasing, using hot water pressure washers is a good choice. Belt-driven pumps are usually found on industrial models. These pumps are suited for cleaning applications that require 40 or more usage hours per week. The belt that connects the engine with the high-pressure pump drives away heat and vibration, minimizes key component repair and extends the pump life by lessening the rpm demand. Direct-drive pumps are commonly used for cleaning applications that do not necessitate more than 30 hours usage in a week. Although these models are not worth recommendable for consistent and heavy usage, they are still a good alternative to costly belt-driven models. When buying a pressure washer, you also have to consider if you will go for one that is powered by gas engine or electric motor. 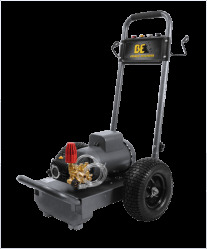 Electric motor-powered pressure washers are not that expensive and are usually lighter and smaller than gas-powered ones. These pressure washers do no emit gas fumes, and thus can be used in an unventilated space. Gas-powered pressure washers are much more powerful than electric motor-powered pressure washers. These units do not need an electric outlet and they are quite durable. But since they emit fumes, these models are recommended to be used outdoors. When buying a pressure washer, you may want to look at three (3) measurements: gallons per minute (gpm), cleansing units (cu) and pounds per square inch (psi). GPM lets you know of the rate of water that will flow through the unit. CU is computed by multiplying gpm by psi (gpm x psi). PSI indicates the pressure amount that will be created by the unit if concentrated on a square inch of surface. Obviously, the cost of the pressure washer should be a consideration. But you must bear in mind that you get what you pay for. Anyone who uses a pressure washer to make a living should consider it as an investment. Another consideration in buying a pressure washer is if the unit has a warranty or if the manufacturer guarantees that it will provide you assistance in case such problems occur. Modern pressure washers are built to last. However, even with proper care and maintenance, there are still instances when some parts just fail. These are just some of the things you have to take into consideration when buying a pressure washer. It is always best to do a little research and ask for the assistance of experts in the industry. Tips on how to save on gas and which machines to use. Find the right power washer for your needs.